Knaanic (also called Canaanic, Leshon Knaan, Judaeo-Czech) is an extinct West Slavic Jewish language, formerly spoken in the lands of the Western Slavs, notably the Czech lands, but also the lands of modern Poland, Lusatia and other Sorbian regions. It became extinct in the Late Middle Ages. The name comes from the land of Knaan, a geo-ethnological term denoting the Jewish populations living east of the Elbe river (as opposed to the Ashkenazi Jews living to the West of it, or the Sephardi Jews of Iberian Peninsula). As such, the land is often simply translated as Slavonia, or Slavic Europe. The term is derived from ancient Canaan (Hebrew כנען "kəna'an"). The language became extinct some time in the Middle Ages, possibly due to expansion of the Ashkenazi culture and their own Yiddish language based on German. This hypothesis is often backed up with a large number of Yiddish loanwords of Slavic origin, many of which were no longer in use in Slavic languages themselves at the time of the Ashkenazi expansion. These are believed to be loaned from Knaanic rather than from the Czech, Sorbian, or Polish languages. The linguist Paul Wexler has hypothesized that Knaanic is actually the direct predecessor of Yiddish and that the language later became Germanized. In other words, the Knaanim, that is, the people speaking the Judaeo-Slavic languages, were the main cause of changes within the Yiddish language. This view has been dismissed among nearly all mainstream academics, however, and contrasts with the more widely accepted theories of Max Weinreich, who argued that the Slavic loanwords were assimilated only after Yiddish was already fully formed. A possible early example of Knaanic is a 9th-century letter for a Jewish community of Ruthenia. 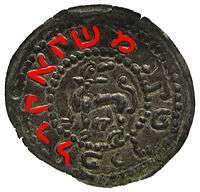 One of the very few commonly accepted examples of Knaanic are inscriptions on bracteate coins issued under Mieszko the Old and Leszek the White, two Polish rulers of 12th and 13th century. The last evidence of usage of the language (written with Hebrew script) come from the 16th century. The reason Knaanic inscriptions (which use Hebrew letters) appear on coins minted for a Polish duke is that at the time he leased some mints to Jews. The mint masters were responsible for collecting bullion and striking coins, as well as periodically taking in and restriking existing coins. The inscriptions on the coins range widely. Some are Hebrew names, possibly of the mintmasters. Some are the name of the town in which the mint operated, for instance Kalisz, the burial place of Mieszko the Old. Some have the Duke's name. One in the National Bank of Poland's numismatic collection bears the word "bracha", Hebrew for blessing. For a list of words relating to Knaanic language, see the Knaanic language category of words in Wiktionary, the free dictionary. Wikimedia Commons has media related to Knaanic language. 1 2 various authors; Szymon Datner (1983). Witold Tyloch, ed. Z dziejów Żydów w Polsce (in Polish). Warsaw: Interpress. p. 6. ISBN 83-223-2095-7. ↑ Max Weinreich; Paul Glasser; Shlomo Noble; Yivo Institute for Jewish Research (corporate). History of the Yiddish Language. 1. New Haven: Yale University Press. p. 525. ISBN 0-300-10887-7. ↑ Paul Wexler (2002). Two-tiered relexification in Yiddish: The Jews, Sorbs, Khazars and the Kiev-Polessian dialects. Berlin: Mouton de Gruyter. ISBN 3-11-017258-5. ↑ Mark Louden (2000). "Contact-induced phonological change in Yiddish: Another look at Weinreich's riddles". Diachronica. John Benjamins Publishing Company. 17 (1): 85–110. doi:10.1075/dia.17.1.05lou. ↑ for instance Max Weinreich (1956). "Yiddish, Knaanic, Slavic: The basic relationships". For Roman Jakobson: Essays on the occasion of his sixtieth birthday, 11 October 1956. The Hague: Mouton. pp. 622–632. (Czech) Šedinová, Jiřina: Literatura a jazyk Židů v Českých zemích, in EUROLITTERARIA & EUROLINGUA 2005, Technická univerzita v Liberci, Liberec 2005 Jiřina Šedinová from the Charles University in Prague seems to be the only specialist to study the glosses written in leshon kenaan which appear in some Jewish religious texts from Bohemia. In this article the author affirms leshon kenaan is just the Hebrew term for the local Slavic language. Bondyová, Ruth (2003). Mezi námi řečeno. Jak mluvili Židé v Čechách a na Moravě (Between us: language of Jews in Bohemia and Moravia) (in Czech). Society of Franz Kafka. ISBN 80-85844-88-5. External link in |publisher= (help) The book documents languages used by Jews in the Czech lands during 12–20th century. Review in Czech, pages 28–33.